By now, many of you in Ridernation and other CFL circles know that I’ve been asked to step into the role of Roughrider Colour Analyst for Harvard Broadcasting during the 2017 CFL season. 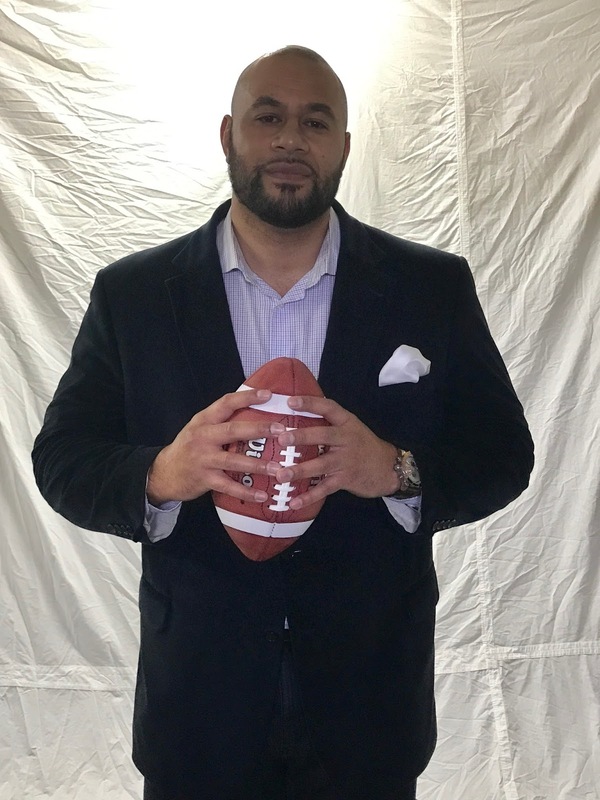 It’s a role that I’m really excited to dive into, and I consider it one of the better jobs in the CFL because of the fan base that it caters to. 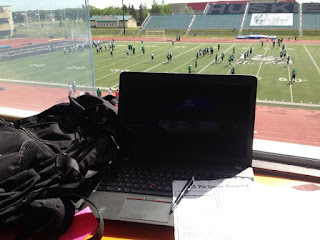 Being a colour analyst is also something that’s very different from the radio work that I’ve had the privilege of doing since retiring from the CFL in 2013. This is a job that requires a ton of work and respect. It’s not just getting on The Sportscage, or the Pre-Game show and airing out my views on the league, and your beloved Green and White. This is important to me, because I know how important it is to some of Ridernation’s most faithful. Stepping into the Colour Commentary spot is also a very bittersweet situation for me. I am being asked to fill the position held by a legend for the last 28 years. Carm Carteri is a role model to me. During my time with the Green and White, Carm was, and still is, one of the best guys to be around. We’re both part of that special fraternity of guys that’s been fortunate enough to strap up and play this game as professionals. There’s always that mutual respect that guys have for Carm because of that. He’s one of us. I consider him a great friend, and to this day he is always there willing to help guys out if he can. I’ve read the blog comments, and the fan site pages. The outpouring of emotion and support for Carm has been incredible, and rightfully so. In this day and age, there will never be a guy that holds down a football job for 28 years. Carm was the medium between the team and fans during the absolute worst of times and some of the best. When people wouldn’t accept a free ticket to Rider games, Carm still invested his time into bringing Roughrider football to life. I hope that we find a way to celebrate his commitment to the fans of this province. I hope that Carm Carteri is celebrated for all he did for Ridernation. There are people in Saskatchewan that are football fans because of Carm, and I was glad to see that the majority of them have spoken up during this time. It shows the love and respect that people have for him. Simply thanking Carm for his services would be disappointing. Even though the shoes that I have to fill are humongous, I’m really looking forward to it. Because of the respect I have to show to the position, things are going to slow down here on Pro Perspective.ca for the time being. I want to thank those of you who have followed along with this site, but I have to pour everything I have into this opportunity, outside of the many other pursuits I have. Training camp is right around the corner. Football is finally back. But before we go any further, we absolutely have to recognize the man who helped bring us to this point. This is a SALUTE to Carm Carteri. You’ve paved the way for guys like me, and you’ve set the benchmark as far as the Colour Analyst spot goes. I’ll work hard to ensure that the standard you set is held up. You're a great ambassador to the game, and a distinguished member of the CFL Alumni. I’ll be the first one to buy a ticket to your Hall of Fame recognition. BC @ Saskatchewan: FINAL Thought.. If we're strictly talking football today folks. Go with the BC Lions. I know it's a sh*tty idea considering the magnitude of this game, but unfortunately the Lions are on a completely different journey and their personnel is better across the board. Dan Clark, Robbie Bagg, and Darian Durant. If the magic of the moment is to equate to a Roughrider win, then it will be on the shoulders of these three vets. Unfortunately that's A LOT to ask. We'll miss the old girl...Everyone has a personal story that goes with this building...Here's a link to mine that we posted last week. Better late than NEVER...Sorry it's late folks! Check out our PICK EM for this week. Anyone else JACKED UP for playoff time?!?!? This game kicks off in about 45 mins (as of this typing) and I’m going stick with my guns from last week despite the Esks losing to the BC Lions…In a playoff crunch, with so many things still undecided in the CFL, I like a Mike Reilly lead team! Admittedly, my prediction also factors in the “West over East” narrative that everyone following the CFL subscribes to at this moment, and as a “spoiler alert” that will probably ring true for the other 2 games we look at today. Many of you know that I support the “West over East” argument; It’s all about balance and control. In my mind, one of the main reasons why Western Teams are better than their Eastern conference foes is because the Western squads all incorporate the ground attack as part of their offensive scheme. For some reason or another, that has been the CONSISTENT case with teams in the “little brother” conference especially in Toronto and Hamilton. This game may very well be a preview of the Eastern Conference Semi-Final, but rest assured, the TiCats aren’t thinking about that at all. Hamilton can still win the division and Coach Austin will have his team ready to ball in all threes phases of the game. Unfortunately for the Black and Gold, Edmonton looks like the stronger team at this point. They’re used to running the rock to get into manageable 2nd downs, and in this phase of the year, having a running attack is everything. Hamilton may have to spend too much time creating other plays that try and make up for the fact that they’re not going to hit you in between the tackles. It’s been a startling trend in the CFL this year; the run game is slowly being replaced by teams utilizing quick throws to the sidelines to get out in space and let guys compete in 1v1 situations. Until an Eastern team can prove that they can get it done on the ground, as well as through the air, myself and many other analysts will be picking the Western squads all the way through the playoffs. May as well start here. Pick: The Reigning and Defending Grey Cup Champs. This week, one of the topics of conversation during my radio work with Rod Pedersen on The Sportscage (620 CKRM) was focused solely in on Justin Medlock. If we were to take Bo Levi Mitchell out of the “Most Outstanding Player” conversation, there is a very legit argument as to why Justin Medlock should be considered for the CFL’s MOP Award this year. The veteran kicker has been the best Free Agent signing of the off season by a country mile, and Winnipeg wouldn’t be where they are right now without him. The Bombers have gone 9-2 over the last 11 weeks with most the scoring being done via Medlock’s leg. Over the off season when Winnipeg was signing their Fantasy Squad of Free Agents it was Medlock that we highlighted specifically because of the amount of close games that Winnipeg had been losing by in 2015. Those L’s have turned to W’s with the consistency that the former TiCat has brought to their kicking game, and Winnipeg looks so much better off for it. The playoffs are a different monster though. Winnipeg needs to find a way to score Touchdowns. Relying solely on Medlock’s leg will be a recipe for disaster…YOU NEED TO SCORE TOUCHDOWNS TO ADVANCE TO THE GREY CUP. Consider these next two games an OFFENSIVE AUDITION for the Blue Bombers as they look to head into “One and Done” mode ready to make an impact. Go with Winnipeg here as they try and lock up 2nd in the Western Conference. Struggling against the Defensively sound Montreal Alouettes at home a few weeks ago was a little bit humbling to the best team in the CFL. I’d anticipate Vernon Adams to struggle a bit here as the jolt of adrenaline he had in his first start wears off a bit. Furthermore, Calgary is about to take a 21-day break from CFL action as their Bye-Week falls in WEEK 20, plus they’ve got the playoff BYE they earned as the winners of the West. The Stampeders need to take advantage of every competitive snap that they have left before they play again in the Western Final. This may not be close. It would be a terrible disservice to their chances at the Grey Cup if the Stamp-machine went into this pseudo-hibernation on the heels of an upset. Pick: The Grey Cup FAVOURITES, Calgary. Go with the Green and White if you're placing bets. The bottom line here is that the Montreal Alouettes are essentially the same squad as they were when these two teams met at the beginning of the year in WEEK 6; the Roughriders are not. Chris Jones' team is playing a fast brand of football and executing at a much higher level in all 3 phases of the game. Jury's out on how rookie QB Vernon Adams does. I'm giving him the benefit of the doubt because he's making his debut against a scheme that shares the same characteristics as the Noel Thorpe scheme that Adams sees every day during practise. It's all about continued execution today for the Riders. They know what they're going to get. This is a FANTASTIC Alouettes defence, however they've simply been asked to do too much all year long. The Angry Bird defenders, need help from the other two phases of the game (Offence and Special Team) and that's where the opportunity lies for the Riders need to assert their will. Saskatchewan has to win the special teams phase and play composed and disciplined on Defence. If the Roughriders can manufacture a clean game in those phases, it will take all the pressure off the Green and White O to the point where they'll be able to employ their game plan without feeling pressed. That calm approach will go a long way in a contest where Montreal will only go as far as their Defence gets them. Take Saskatchewan in a 2nd half that may see the Riders pull away. Today's OFFSIDES episode takes a hard look at the current (and potential?) playoff system format that has been all the rage as of late. Coach Etch and I also dive into a QUESTIONABLE league decision as it pertains to the FINE SYSTEM that is currently employed in the CFL. Always a pleasure to drop these podcasts for you guys, and we really think you'll enjoy today's FOOTBALL CONVERSATION! I'm off to the Canadian Red Cross' Power of Humanity Gala! Talk to you tomorrow! Now that we're back in the saddle, here's our picks for WEEK 18 in the CFL (minus the Saskatchewan Roughrider game that we'll dive into on Saturday before kick-off). In true CFL fashion the only thing that's set in stone is the plight of the Calgary Stampeders, and because of that, we're all in for a GREAT finish. Let's get into it! Thanks to our partners at CJ Evans Home Designs for making this possible! Much of the attention in the CFL has been focused on the teams in the West, and consequently, this battle for the top spot in the Eastern Division has taken a bit of a backseat. One of the major reasons why this has happened is due to the fact that everyone seems to have written off the entire Eastern Conference. With a miniscule gap seperating them in the standings, both squads will tell you that this is a must-win. However, if we look at the schedule after this week’s match-up, I’d venture to say that it’s far more important for Ottawa to come out on top. The RedBlacks have a back-to-back against a Winnipeg Blue Bombers team that will be in a dogfight for Western positioning until the end of the year. Hamilton has the Edmonton Eskimos, who are a part of that fight, but the TiCats get to finish the season in Montreal against an Alouettes with ZERO to play for. Schedule Advantage: Hamilton. There is ZERO cushion in the Nation’s Capital. I’m taking the Ottawa RedBlacks and I’ve got two words to back it up...Henry...Burris. Who better than a sure fire Hall Of Famer to be Quarterbacking your squad in the most important phase of the season? It’s all about experience, and the composure that comes along with it. Don’t buy into the media factions that are selling the idea that Hamilton is in trouble. They’ve got the talent necessary to get it done; the Black and Gold just need to find their footing, and some consistency. One of the things I loved most about playing in the CFL was the fact that in some way, somehow, the end of the season always involved a lot of fireworks. I don’t think I was ever a part of a team that could afford to coast into the last few weeks of the year and I’m sure that everyone involved wouldn’t have it any other way. This game is a GREAT way to kick off an exciting finish to 2017. Not much to this game. Many hate the fact that the Toronto Quarterback situation has become a circus act with a number of main attractions, and sadly that’s not the only thing that seems to be tearing at the fabric of the Argonauts. I remember being part of a Montreal Team (in 2012) that seemed to hold its collective breath every time the LEGENDARY Anthony Calvillo got hit, and the situation with the Double Blue seems to have taken on the same fate. Expect Calgary to roll in this one. For those questioning how the Stamps will approach the last two games of the year, might I remind you that the Stampeders are staring down the barrel of the same gun the Defending Grey Cup Champion Edmonton Eskimos were last year. With a Week 20 BYE, and the additional week off that they have earned by dominating the league, Calgary is looking at a 3 week layoff before competing in the Western Conference Finals. The CFL’s best team needs to take advantage of all the reps they can get from here on out. What a fantastic way to end WEEK 18 in the CFL! Welcome to the Western Division folks. This game between the Lions and Esks has three storylines attached to it. Not only is the playoff cross-over (which looks juicy) a piece of the puzzle; but there’s still a very real opportunity for both teams to earn a home-playoff game by finishing 2nd. Finally, the spot that NOBODY wants (which is 3rd place in the West) lays waiting for whichever team flinches first. This is the type of game that people have come to expect from the West in Mid-October. If the BC Lions can manage to avoid the turnovers that plagued them in both of their losses to Winnipeg, one may be inclined to give them the edge because they’re at home. I’m going to go in the opposite direction and give the nod to the Championship Mentality of the Edmonton Eskimos, and much like the Ottawa/Hamilton pick, I like the Quarterback! All eyes on the leadership of Mike Reilly from here on out. Much has been made of the fact that he's a guy that teammates would run through a wall for, but more importantly, the Esks will need his toughness and character to will them through the adverse the tough times ahead. With the sense of urgency that surrounds this time of the year, and one or two plays separating a WIN and a LOSS, there's nobody better to have leading a group than #13. Pick: The Reigning, and Defending Grey Cup Champions. Although we took a brief Pick-Em hiatus, we wanted to ensure that we got back in the saddle this week. Although it was a 3-1 Week in our CKRM Pick-Em pool hosted by RodPedersen.com, we didn't post them to this site, so we'll call them "unofficial". With the Saskatchewan Roughriders being all the rave right now, here's some analysis on why one should feel good about going into kick-off against the struggling Argos in Toronto. As always, our pick-em is brought to you by our good friends at CJ Evans Home Designs! Earlier on in the 2016 season (WK 3) when we took a look at this game, there were a couple of deciding factors that eventually led me to take the Argos. The first reason, was the ability of the Double Blue Offensive Line vs the Roughriders Defensive Line, that featured a lot of inexperience, and hadn’t established an identity for themselves as of that point. Fast forward to today, and what we have now is a Saskatchewan side that is vastly improved in all phases of their football team, and has started to execute at a much higher rate. Essentially what is beginning to take place is that the talented players are starting to become a talented TEAM. That does not bode well for their opponent. For may of the Rider Die-Hards this Week 17 matchup may be the best indicator of how far this team has come (albeit slowly). At the early phases of the season the veteran laden Argos were looked at as a Grey Cup Darkhorse and much was being made of the “re-build” in the Prairie Province. Since their first meeting the Argos have fallen hard, and Saskatchewan has done nothing but trend upward. It’s taken a long time, and unfortunately the play-offs are out of the question but the plan that was questioned so many times during the year looks like it’s finally starting to bear fruit. Take the Roughriders today. Depending on how well the team was able to handle the week of prep in Ontario prior to this game, the potential to jump out to an early lead may be present for the first time all year. With the way the Defensive Line is playing now, versus the beginning of the year, one may venture to tilt the scales in the Green and White’s favour. Last week the Calgary Stampeders physically pounded the Argo Olinemen at the Line of Scrimmage in a one-sided affair. Not only are the Roughriders starting to play more physically, but some of the schemes that they’ve been running require a team to prepare a lot more than they’re normally used to. With more schematic confidence, one is starting to see the benefits of playing without “over-thinking” every rep. The athleticism of guys upfront is starting to show. Maybe the biggest positive here is that the communication amongst the entire Defensive unit (especially the back-end) has been far better as of late. There’s still plenty of room to improve, but the progress is worth noting. It’s clearly the biggest difference from Week 3 to Week 17, and should be something to get excited about. What will definitely help is the fact that the Rider secondary gets to take their shot at a receiving core, and a QB, that are only playing together for the 2nd straight week. That is a huge advantage, and a total flip of the “youth vs. experience” model that Saskatchewan found themselves up against for the majority of the year. The tables have turned a little bit when we look at these two teams. Although it was expected, the Roughriders ability to focus on the task at hand is still something that needs to be consistent. Although everyone seems to be expecting an Argos loss, this is still a team that is in the middle of a playoff race, despite going through a tough time internally. It’s all about the 1st quarter today. The Toronto Argonauts need to start fast and play with a major sense of urgency, and the Roughriders need to be ready for their best shot early on. If Saskatchewan can withstand the first wave of the Argo assault, and maybe some trickery, this talented TEAM should come away with their 4th W in as many games.